Billy Dean is a secret child. His world is a carpet, a bed, pictures of the holy island, and a single locked door. His father fills his mind and his dreams with mysterious tales and dreadful warnings. But then his father disappears, and Billy’s mother brings him out into the world at last. He becomes the Angel Child, one who can heal the living, contact the dead, bring comfort to a troubled world. But there is one figure who is beyond healing. From master storyteller David Almond comes a gripping, exquisitely written novel about a hidden-away child who emerges into a broken world. As an English teacher, I have a deep respect for dialogue and dialect--especially Southern. Billy Dean has a dialect all his own, one that's truly original. It reminds me a little of the BFG, where the dialect makes the character that much more endearing. It also helps to make the story a bit darker than one would expect. The dialect enhances the mystical setting of Blinkbonny and the setting surrounding Billy Dean's imprisonment for some thirteen years. 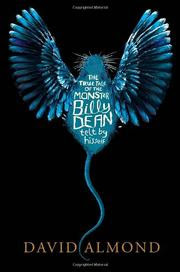 Of course, there's more to Billy Dean's story, and the complex relationship with his father (and his father's absence) complicates the novel in a unique way. Billy Dean explores religion and God (or perhaps the lack thereof). Almond teeters between the realistic and the fantastical more effectively than a lot of YA writers that I have read lately. While it takes some time to get used to Billy Dean's language, it's well worth the effort.